Our best soundtrack tournament continues with two new titles. 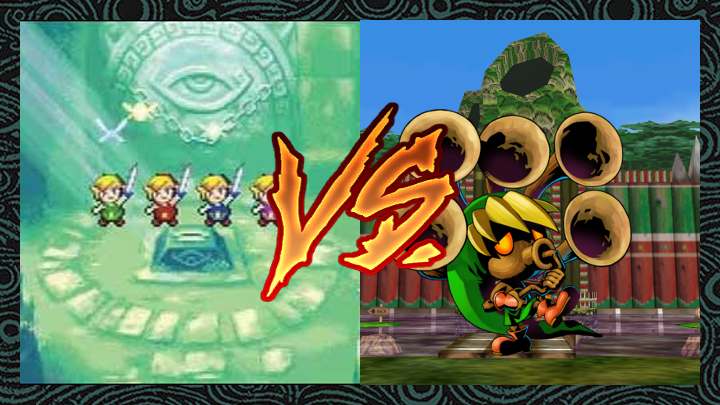 As Tri Force Heroes and Breath of the Wild duke it out in yesterday’s poll, Four Swords and Majora’s Mask step into the fray. So far in our tournament, we’ve seen plenty of love poured out for portable titles like Oracle of Ages, Oracle of Seasons, and The Minish Cap. Well, the music of the original Four Swords game is right at home with these other soundtracks, boasting a collection of charming 16-bit tunes. The song list may be on the short side, but there are definitely a few gems to be discovered in this overlooked GBA title. And fans will be pleasantly surprised to hear a few old favorites as well, such the Fairy’s Fountain theme or Princess Zelda’s theme. To say that Majora’s Mask dominated Round 1 would be an understatement. Only a mere 24 hours after its poll went live, this game had earned more votes than any other game in the tournament’s first round, despite some other polls being live for more than four days at that point. Poor Phantom Hourglass didn’t even have a chance. Citing several stand-out songs from the game, fans shared about the OST’s emotional weight and thematic significance. It’s fairly clear that Majora‘s soundtrack is a favorite to go on to the finals.